Surat, April 14: In an attempt to provide more mileage to our users spread across myriad countries, eZee – one of the few total hospitality solutions providers have initiated integrations with popular online travel agents. The OTAs are PegiPegi (Indonesia), Edreams Odigeo (Spain) and DOTW. Hotel Bonanza, Buzzotel, and Goomo of India respectively. Travlu (Canada), Rurubu and Jalan of Japan have been added to the list of 100+ connected OTAs of eZee. Pegipegi is based in Indonesia, targeting the local travelers providing them hotels in popular cities. The OTA associates with hotels as a business partner too and provides other necessary information related to travel to guests. Edreams Odigeo is a famous Spanish travel company. To the travelers, it provides with hotel rentals, flight bookings, and other facilities. Famous in Japan, Jalan travel website provides myriad hotel accommodations at various popular destination across the country. Having hotel in Japan? List your hotel on this OTA. Popularly known as Rurubu, the Japanese OTA facilitates tourists and locals in the country giving them comfortable staying facilities at prominent cities across Japan. Travlu is a Canadian online agent that assists in finding the best hospitality services across 85,000 destinations worldwide. It provides the best deals for the travelers, comfortable stay, and traveling assistance. If your hotel is in Canada, list it on Travlu OTA. An online travel portal Goomo, India, is a great platform to connect your hotel. Offering affordable flight tickets, hotels, holiday packages, and more, your guest can enjoy a perfect vacation at your site. Aimed at propounding competitive price of hotels to the guest, Hotel Bonanza charges low commission from hotels. This OTA is currently functioning across India, and you can list your hotel to get more profit on bookings. Buzzotel is Bangalore, India, based organization that helps hotels across the world with bookings. It provides hoteliers with business insights that allow them to set right pricing for the right rooms at the right time. Hoteliers in India can plan to enroll with this OTA for a hike in bookings. 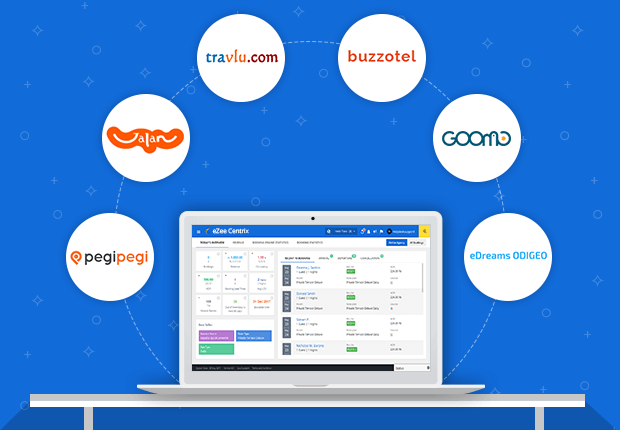 With all the above integrations of OTAs with eZee’s solution, you can choose to capitalize on these OTAs for higher revenue.